With the Auto Expo 2014 drawing near, Nokia has now released a special app for its Lumia users who will be attending the expo. The organizers of the Auto Expo 2014 – The Motor Show, which is scheduled to be held from February 7 – 11 at the India Expo Mart, Greater Noida, Delhi, have released the event’s Windows Phone 8 app for Nokia Lumia devices. The app not only gives info about the various exhibitors, but also provides relevant information about Organisers, Parking, Ticket, Facilities, and Shuttle Service. The Auto Expo app can also be used to directly book entry tickets. The app would give news updates and other notification periodically. The organizers had earlier announced the app for platforms like Android, IOS, etc. 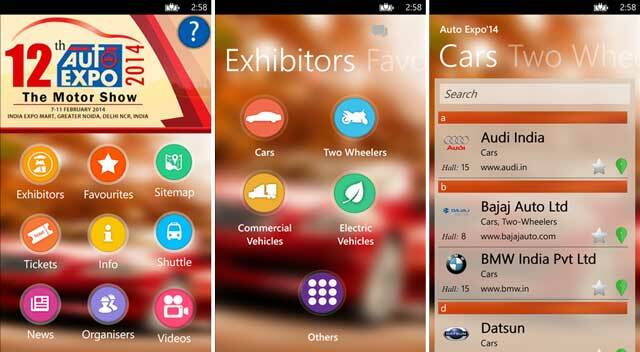 You can download the Auto Expo ’14 app on your Nokia Lumia device by downloading it from the Windows Phone Store.